Life happens and sometimes it happens at the expense of the finish of of your walls. I know my walls have taken a huge amount of abuse. These abuses range from roller skates and skate boards bumping into the wall, to elbows going through the wall during indoors football, all the way to bb’s embedded in the wall. While my boys all tend to claim these things happen purely as “accidents,” the damage left behind still must be dealt with. No one wants to have huge holes in their walls, especially when company comes over. I have become quite adept at general home maintenance. 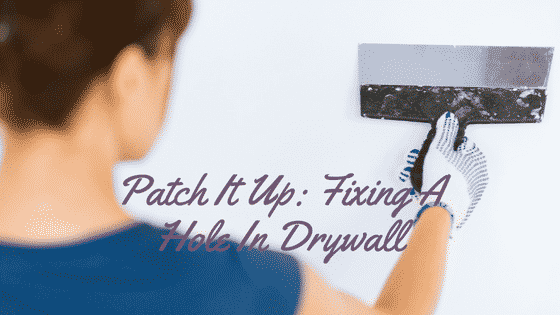 Fixing a hole in drywall can be quite easy. The key is to not be intimidated. The following four step outline can help. The first thing to remember when patching a hole is to prep the area. If the hole is smaller – like a tiny dink – you may be able to just fill it with some joint compound and move on. If it is larger it will need prepped. You will need to cut out a square around the hole that is just slightly larger around the hole. Cut out a piece of drywall the same size as the hole you have cut out. A small piece of wood can be mounted into the hole and screwed to the drywall by screwing it on. This gives more stability to the patched portion of the wall. Screw in your patch piece. Next you will want to use drywall tape to cover the seams along the edges of your patch piece. After that, you will use a quick set joint compound or spackle to seal the mesh tape to the wall. This joint compound will need to set until completely dry. i like to use the joint compound that changes from a pale purple to white as it dries to be enure it is ready to sand. Once dry, the area is ready to be sanded down smooth. After sanding, it should be wiped with a tack cloth or a damp cloth to remove all the dust from sanding. Be sure to double check your paint color and then paint the wall to match the existing paint finish. There you have it. Patching a hole in your wall is as simple as that. Now you can do it all on your own and not waste your hard earned money on a handyman. I have even gone so far as to teach my older boys how to do this simple home repair.